وجه العملة سيدة الحرية تقف على سلم و عبارة "STARVING Z50 2019"
سيدة الحرية تقف على سلم و عبارة "STARVING Z50 2019"
1oz Zombucks Starving Liberty Silver Round The Starving Liberty is the seventh round in the ten round Zombucks series. These rounds are designed to awaken the sleeping amongst us, and to save humanity from itself! The reverse side shows a bio-hazard symbol with blood splattered around it, reminding humans of the apocalypse hazards. The words "Zombucks Currency of the Apocolaypse" leave us in no doubt as to possible future usefulness of this round. 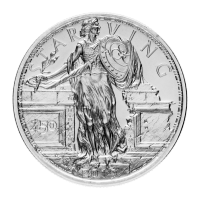 The obverse features a starved and almost skeletal Lady Liberty, her bones visible beneath her skin. Her clothes are tattered and torn, and she appears to be on her last legs. Her shield and armour may offer her some protection, but her battle is close to being lost. The year 2019 is the predicted date of the apocalypse with a denomination of 50 Zombucks, the currency of the zombie apocalypse. As with the rest of the Zombucks series, these rounds will be produced for a limited period of time. Prepare yourself for the zombie apocalypse today!